Author: Evelyn Fogwe Chibaka. Series edited by: Wilhelm J.G. Möhlig, Bernd Heine. 4 pp. Roman, 203 pp. Metta, which means “one who wants to know or acquire knowledge”, is a Narrow Grassfields language and thus belongs to the Bantoid branch of the Niger-Congo language family. This language is also known as Menemo, and it is spoken by about 45,390 speakers in North-West Cameroon (Source: SIL 1982). According to more recent estimation the number of speakers is much higher (183.000 spaekers, Cameroon Association for Bible Translation and Literacy CABTAL, 2010). This work concentrates on the relationship between focus-marking and wh-fronted questions formation in the Metta language. It also examines how the parametrio-syntactic process involved in their derivation integrates into Universal Grammar principles. But beforehand the author gives a description of the phonology, and orthography as well as of the nominal and verbal morphology and the word order of the nominal class language in question. What follows is a detailed presentation of the various focus constructions and the interrogatives. For these analyses the study adopts the Generative Syntax Theory, where emphasis will be laid on the Principles and Parameters Theory and the Minimalist Program to explain the syntactic analyses. Aim of the book is to establish a simplified approach to the derivational processes involved in focus-marking and wh-question formation in Metta, and to establish a single rule for the two syntactic processes. Focus constructions in African languages exhibit a number of trends of general theoretical, typological and methodological significance as related to its definition and scope of the category of focus extension. 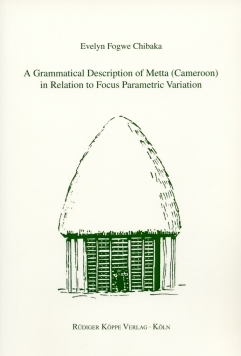 Thus the book is addressed to general linguists as well as to african linguistics. A table of contents can be downloaded under PDF documents.